I am just going to be real, I am adding this post late and will try my best to recall our vacation from September 2008. Let me first say that we are due to revisit again. I really want to visit and reunite with my ohana. I missed our huge family reunion last year 2016, but it was unfortunate that we couldn't make it due to my daughter's major surgery. 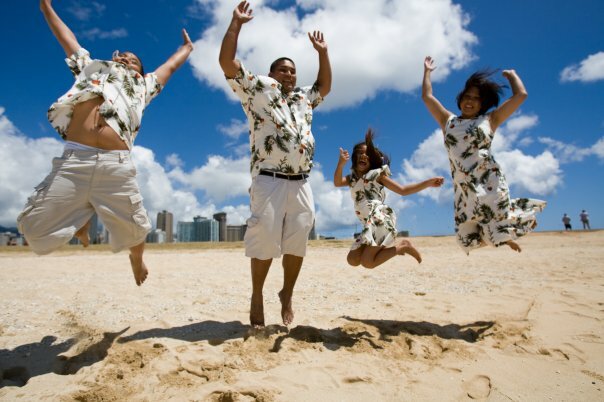 We booked for a quick family getaway for 8 days, 7 nights in on Oahu. We stayed at the Regency on Beachwalk Waikiki by Outrigger which was such a comfort of home. You get the full feel of a condo which has a full kitchen, sofa bed, beautiful bathroom and a separate bedroom. We had a car rental so we can just drive around the island. We purchased the 3-day GoOahu cards to allow us to get some activities in without spending a fortune. It would allow us to go to the waterpark, SeaLife, Dole Plantation, Polynesian Cultural Center, bike rentals, kayak rentals, a sail away, and more. Along side of that, we went shopping, ate some good grinds at some good local spots, went into China town for some live Dungeness crab and fresh market produce to cook back at the condo, grocery shopped, went to Waimea Bay, Ko'Olina, Kailua, and more. We really enjoyed being in the middle of the middle of the ocean of Kailua. I got stung by a jellyfish, but it was such a beautiful ocean of clear water. Speaking of Kailua, we still salivate when it comes thinking about Boots and Kimos Macadamia Pancakes, Romy's Shrimp Plates, and Leonard's Malasadas. I wish I knew what vlogging was back then so I can capture so much of a wonderful time. All we had was but a few pictures. All worth the experience.